The party and state delegation of the Republic of Cuba led by Salvador Antonio Valdes Mesa, member of the Political Bureau of the Central Committee of the Communist Party of Cuba, first vice-president of the Council of State and first vice-president of the Council of Ministers of the Republic of Cuba, arrived in Pyongyang on September 8 to attend the events for celebrating the 70th founding anniversary of the DPRK at the invitation of the Central Committee of the Workers' Party of Korea and the DPRK government. 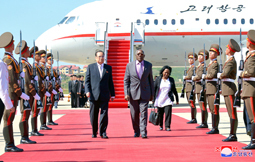 The delegation was greeted at Pyongyang International Airport by Ri Su Yong, member of the Political Bureau and vice-chairman of the WPK Central Committee, and Choe Hui Chol, vice-minister of Foreign Affairs, officials concerned, Jesus De Los Angeles Aise Sotolongo, Cuban ambassador to the DPRK, and his embassy officials. Pyongyang citizens welcomed the delegation, sending warm greetings to the friendship mission of the Cuban people.